Players take it in turn to add cactus stems to the cactus base. Stems can be added to any of the holes but selecting the wrong location may result in the cactus toppling over. The player who makes the cactus fall over is out of the game. 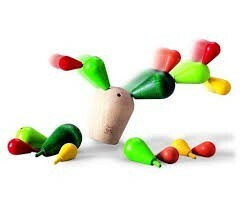 The balancing cactus helps develop children's motor skills and spatial awareness. It's a beautifully coloured toy and the highly finished wood pieces make it very tactile. Beautifully coloured and highly finished wooden toy. This toy has been designed to be environmentaly friendly whilst promoting sustainability.